The pinnacle of rinseless wash systems! 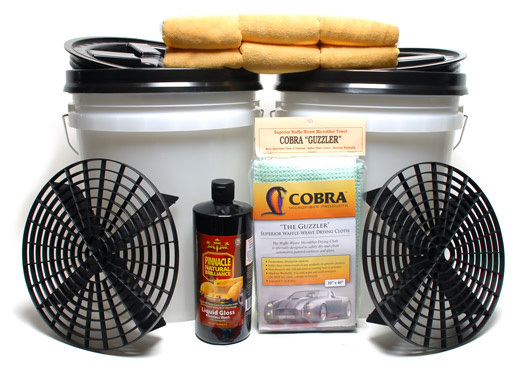 Includes buckets, Grit-Guards, and microfiber towels. CLICK HERE to view the Autopia "How To: Rinseless Wash Your Vehicle" Guide. Safely give your automobile Pinnacle's trademark wet shine each time you wash it with The Pinnacle Liquid Gloss Rinseless Wash Two Bucket System. Pinnacle has a proud tradition of creating dazzling wet paint finishes using the finest blend of ivory carnauba waxes. Pinnacle Liquid Gloss is formulated with the purest grade carnauba wax to clean, protect, and shine your automobile in one easy step. This ultra-high lubricity formula floats dirt and grit off of the surface without scratching. The premium Pinnacle carnauba wax imparts a deep, shimmering shine that dances across your body work. Pinnacle Rinseless Wash with Carnauba is the quick and safe way for connoisseurs to care for their automobiles. The proper tools and accessories make rinseless washing even safer. That is why Pinnacle pulled out all of the stops creating this inclusive system that features 2 five gallon Pinnacle Wash Buckets, 2 Grit-Guard � inserts, 6 ultra soft Gold Plush Jr. Microfiber Towels, and a soft and absorbent Waffle Weave Guzzler drying towel. Pinnacle Liquid Gloss Rinseless Wash with Carnauba cleans your automobile without rinsing. That means less water running down the drain or finding its way into rust prone areas of aged coachwork. By eliminating the need for a rinse, you can now pamper your automobile with the finest care anytime, anywhere! The advanced cleaning agents in Pinnacle Liquid Gloss Rinseless Wash with Carnauba encapsulate road soil, dirt, filth and grime providing a protective barrier against scratching the most delicate paint finishes. The edition of Pinnacle carnauba wax imparts your paint and brightwork with that distinctive rich glow and natural protection. The five gallon Pinnacle Wash Bucket makes regular and rinseless car washing even safer with the inclusion of a Grit-Guard � insert. The addition of a Gamma Seal Lid allows you to take your full wash bucket with you or store wash supplies safely away. The Pinnacle Liquid Gloss Rinseless Wash Two Bucket System includes two wash buckets, one for the wash solution and a one for rinsing the wash towels out during use. Gold Plush Jr. Microfiber Towels have a deep pile and soft blend of fiber making them ideal for use with waterless and rinseless wash systems. Wash a section of the car using ample solution from your wash bucket, then rinse the Gold Plush Jr. in the second, rinse bucket, before adding more solution. The Guzzler features a plush, 80/20 waffle weave that increases its surface area for greater moisture absorption. This towel can absorb 7 times its own weight in water! In fact, this towel is 20% plusher than our other waffle weave towels to give it even an even greater capacity for moisture. Dry each panel immediately using the Guzzler Waffle Weave Drying Towel immediately after washing. Fill the first Pinnacle Wash Bucket four gallons of water and two ounces of Pinnacle Liquid Gloss Rinseless Wash with Carnauba. Add an additional ounce of product for heavily soiled automobiles. This will be your wash bucket. Fill the second Pinnacle Wash Bucket with four gallons of rinse water. This will be your rinse bucket. Insert a Grit-Guard Insert � into the bottom of each bucket. Soak the appropriate number of Gold Plush Jr. Microfiber Towels in the wash solution. Now begin washing, from the top down, a panel at a time. Squeeze an ample amount of solution over a panel then lightly clean using light pressure. Immediately dry the panel with the Guzzler Waffle Weave drying towel. Rinse your wash towel in the rinse bucket prior to picking up more solution. Wash and dry a panel at time, cleaning your wash towel frequently. When the towel becomes heavily soiled, switch to a fresh, clean Gold Plush Jr. Microfiber Towel. A total retail value of $159.89. You save $59.90!